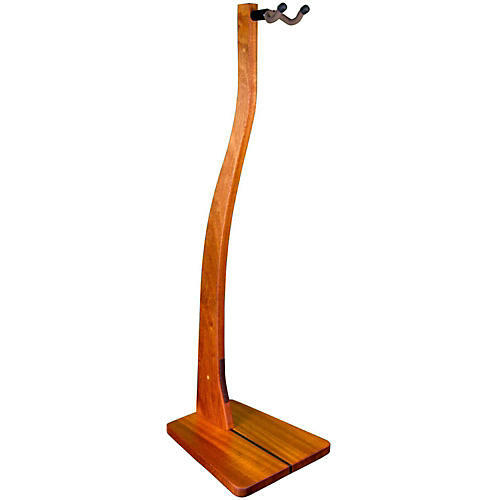 Show off your prized instruments in any environment with a finely crafted guitar stand. With 38" of clearance from cradle to base, these stands are perfect for full size Acoustic or Electric Guitars. Each solid-wood stand is individually hand-crafted using premium stock - no particle board. These stands are as beautiful and unique. Each stand in made in the USA and features its own unique wood and grain pattern. Display your guitars with confidence. Each stand features the USA-made String Swing cradle, the finest available. Each stand is solid wood construction and weighs about 9 lbs when assembled. Assembly requires only a Phillips head screwdriver and takes just minutes. Your search for the perfect guitar stand is finally over. This is not just a guitar stand. This is a piece of beautiful furniture. Our award winning (Best in Show NAMM 2015) stands are hand-crafted in the USA. The solid wood pieces are fashioned deep in the heart of Texas, from premium grade stock. The yoke is a USA-made String Swing cradle, the finest available. The construction is solid. The design beautiful. When you hang your favorite guitar on this stand, you'll be proud, knowing that as soon as your guitar-playing friends see this stand, they will immediately want one too. It's because of this that we're able to make our 100% satisfaction guarantee. If you don't absolutely love this stand - for any reason - just pack it back up in its box and ship it back. We will immediately refund your entire purchase price. No questions asked.